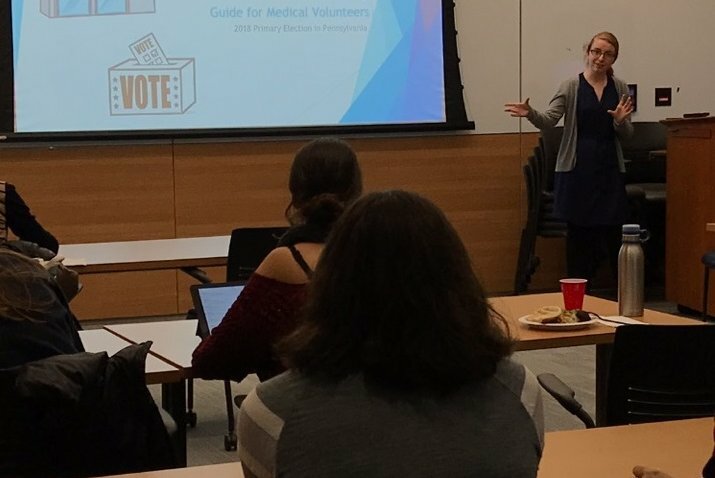 Erin Hollander leads a training session for 'Penn Votes Project' volunteers who helped patients at Penn Presbyterian Medical Center and the Hospital of the University of Pennsylvania cast ballots despite being hospitalized on Election Day. Next Tuesday is Election Day. Voter turnout is expected to be high, but all the “get out the vote messaging” in the world – not to mention personal plans to get to the polls – matter very little if someone is unexpectedly hospitalized. That unique challenge prompted physicians, medical students, law students, notary publics and others within the University of Pennsylvania Health System to expand their goal of helping patients vote via absentee ballot. In that mission, they're not alone among Philadelphia hospitals. The Penn Medicine push started in 2016 at Penn Presbyterian Medical Center. Now it is expanding to the Hospital of the University of Pennsylvania, which explains why the “Presby Votes” program has been renamed the “Penn Votes Project” in advance of November 6. Dr. Judd Flesch, an assistant professor of clinical medicine and residency program director for internal medicine who helms the effort, said it all started when a medical student asked one simple question of a supervising doctor: What do these people do to vote? Knowing there was high-interest in the presidential election, the doctor brought that question to Flesch who, after a team examined the legalities, helped form a small team of medical students, residents and a notary to help nearly 20 Presbyterian patients from Philadelphia vote via absentee ballot. “It was a bit of the rush at the end,” he said of a process that drew an unsuccessful legal response from an attorney representing the Philadelphia Republican City Committee. “That first time was a bit haphazard. We decided to do it in a more organized fashion in the future. "We’ve expanded a little each time, with a big expansion this time since we’re doing it at HUP and Presbyterian,” Flesch said. All told, an estimated 65 patients were able to vote in the previous three elections thanks to the program. The process of voting while hospitalized can be both simple and complicated. As to the former, if a patient expresses a desire to vote, a Penn Votes Project volunteer will get them an application for an absentee ballot. Once filled out, a doctor reviews it to ensure they meet the criteria for the requisite verification that they’re too sick to vote in person. Penn Votes Project volunteers wear these pins as a form of outreach. That all has to be completed a week before Election Day. There are contingencies for would-be voters hospitalized after that deadline, though. Emergency absentee ballots can be used between 5 p.m. Tuesday and 5 p.m. on the Friday just before the election. After that, volunteers need to obtain last-minute emergency absentee ballots, which require an election judge’s review. Law students with Penn Votes serve as the patient’s “designated agent,” or go-between, for patients from Philadelphia. They get the ballots to election officials and work at hearings should the timing necessitate a judicial review. Helming it from that angle is a Penn law student named Neil Deininger, who has been with the project since last spring. He said working to make a difficult process easier made sense for him and other members of the pro-bono Democracy Law Project. He estimated that 15 law students have volunteered to help. "You don't really consider or think about it, but once you're confronted with it, you realize it's a serious problem," he said of voters potentially missing a chance to cast a vote because they're hospitalized. "This was the way in which we could help, handling the City Hall and courts aspect of it. "It was a project with great appeal since you could tangibly help voters," Deininger added, "and be in court as the agents of the patients." When Penn Votes held the first of two training sessions on Wednesday night, 33 people attended. Another session will follow on Monday night. Organizers expect some 50 medical student volunteers, 10 nursing students, around 20 physicians, and a notary at each hospital involved this time around. Erin Hollander, a second-year medical student who got involved before May's primary election, led Wednesday's session, which walked medical, nursing and law students through the entire process. It marked the first joint training session for separate entities (and the first-ever for nursing students) who were well-versed in their individual responsibilities but knew little about what the others were doing, she said. Hollander got involved because she was raised to understand the importance of volunteering and voting as a tenet of democracy. "We wanted to be able to give an overview of how the whole operation works," she said of the volunteers who take applications, field phone calls and more. "It's very difficult to give an estimate (of how many people will be able to vote because of this) because it's never been done before and no other hospital has this kind of system in place. "My personal goal is for 100 patients to get ballots, but I don't know if that's realistic. When I tell people about it, the reactions are usually 'I never thought about that' to 'I can't believe something like this didn't exist before.' I'm glad knowledge is getting out about it so we can help patients already facing a really difficult time continue with their lives as normal." Outreach isn't done. Penn Votes is still looking for ways to get word out at the hospitals “without burdening care providers,” Flesch said. Approaches to that end include ads on hospital televisions, text messages, flyers on bulletin boards, a Google Voice number to call or text so a volunteer can go to their room, and educating care teams so they can mention it to patients and their families. “There’s a discussion about whether flyers can be put on dietary trays, but that hasn’t been approved,” he said. “We make it very clear that anybody who wants to exercise their right to vote absolutely can." The expansion in time for the midterm elections means the Penn Votes Project can help voters from the suburbs for the first time, as well. “The biggest limitation before was that we didn’t have the manpower to drive out to Doylestown, Norristown, West Chester or Media," Flesch said. "This year, we’ll do the first half (of the process) and then a family or friends can be the designated agent (who take the ballots from patients to election officials in the suburbs)." Though their burgeoning program is by far the most extensive locally, Penn isn’t alone in helping hospital patients exercise their right to vote. City Commissioner Al Schmidt said that supervisors from the elections office met with representatives from Penn, Temple University and Thomas Jefferson University hospitals to make sure everybody was on the same page. At Temple, the Office of Patient Experience has undertaken a similar mission as the one at Presby and HUP. Supervisor Leah Kellar said Temple's push started with the November 2016 election and has picked back up with this general-election cycle. Magee Rehabilitation in Center City doesn’t have the same sort of last-minute emergency cases as Penn, as it’s a long-term recovery facility, so that gives patients a little more time to get their voting needs addressed. Robin Parry, concierge at Magee, said they start promoting assistance about a month before the registration deadline. After that, she looks into providing absentee ballots for long-term residents when they realize they won’t be home to vote, and announce it to family members. Parry prints out applications, helps patients fill them out (if they’re unable to do so themselves) and, as a notary, can handle those requirements as well. So far this year, she said she’s helped 10 patients complete the process, but many others are in such critical shape that their minds aren’t on politics. Over at Moss Rehab and Albert Einstein Medical Center, patients who seek them will be provided with absentee ballots and a list of traveling notaries to help them cast a ballot, spokesman Kerry O'Connor shared. Election-related services like these isn’t something Hahnemann University Hospital has ever offered patients, but “it is a great idea and is going to be presented to our leadership team for future consideration,” said Phil Ellingsworth Jr., the hospital’s director of communications.